There are lots of people out there holding out for the Blackberry Bold, and T-Mobile have some news for them. They’re the first to announce they’ll be carrying it, with stock arriving in September (chances are it’ll be carried on most networks though). It’s a good looking phone, with WiFi, HSDPA and GPS. The trackball has also been given extra functionality, so you can now use it to do things like zoom in and out of web pages. Web browsing overall is supposed to be massively improved compared to previous Blackberry devices, giving you the choice to browse in the mobile setting or as a normal web page. 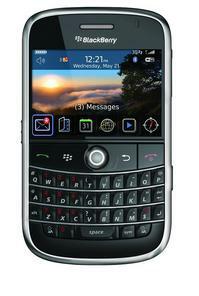 It’s also the first HSDPA Blackberry to be quadband, which is no small thing for those who jetset around the world. It comes with 1GB of internal memory, although this can expanded using the MicroSD slot. The camera is rather measly 2 megapixels, but I suppose the good news is that this means you’ll be able to fit lots of pictures on the phone (silver lining hunting). I spoke to T-Mobile yesterday evening and they kinda confirmed that the Bold will be available “soon” but when I am not so sure. I have an upgrade scheduled around now, but they reckon that the Bold will be worth waiting for and suggested that I try to get the device at the end of October perhaps November. Personally, I reckon that this is well worth the wait, but whether I can get it for free is another thing… might have to upgrade the tariff at the same time. Having said that, if this is to be made available to business customers only, then that will be a marketing nightmare for T-Mobile as the positioning for the product as outlined by RIM, the manufacturer, is certainly within the consumer market – you know, regular people like you and me. There has been talk of this being the iPhone killer, but I doubt that, however, that statement alone clearly indicates it’s intended target audience and it seems not to be the stereotypical business user for a change. I’ve been we T-Mobile for some time and in my experience they have consistently under delivered on service both to consumer and business customers alike. The customer service is laughable, the lack of knowledge on the phones offered – seriously they don’t carry that many phones compared to other operators, but speaking to their customer service department borders on painful at times. I tried to find out about upgrading to the bold and after 3 calls on the same day I was told 3 different release dates, 3 different price plans and varying options to get mobile email, the most stunning piece of news was that I could not get a Bold with a lower priced plan and add the blackberry service as part of the contract to get the phone for a reduced price but if I added their unlimited data plan (Web ‘n Walk) that would reduce the price. For a Blackberry device, really????? At the moment some of the other operators in the UK market seem to know better what they are selling, and I’ve been told that some actually do value retaining customers as opposed to concentrating on getting new customers, so it really looks like time to move on. Ah well…..shame, signals not too bad in my part of London. Seriously, their price plans may be on point, but the line of phones they carry are uninspiring. The staff seem so clueless. ALL THE TIME. I myself am sick of T-Mobile’s release strategies. I am also sick and tired of the poor line of phones they carry. I have been with them since 2001, and you would think that they would offer their long time loyal subscribers some incentives and offers. Rather it always just the first-timers who get the goodies. It really pisses me off. Great news that T-Mobile is going to carry the Bold and carry it soon. But it is a total pain in the neck that it will (at launch at least) only be for business customers. How about us high-spending consumer customers who want one. As usual, T-Mobile has made a poor decision with its handset plans.